Fin Croll and Ollie Hill represented the Kent under 13 team, at 800 metres and both came away having run significant personal bests. Fin was 6th in the A-string race in 2.16.70 (1.3s pb) and Ollie was 7th in the B race with 2.25.84 (2.0s pb). Fin's time tops the clubs under 13 rankings for the season. 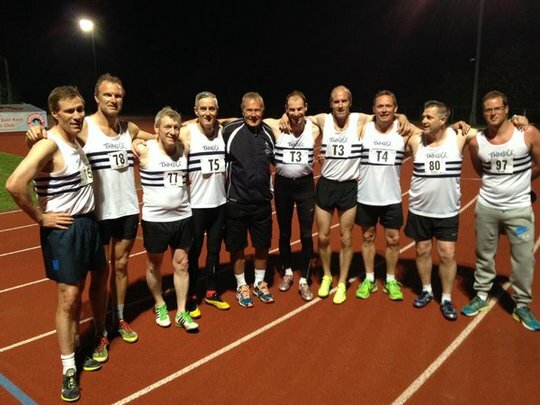 Chris Olley won the SOAR sponsored mile at Battersea in 4.13.54. By Watford Wednesday standards the weather was not as welcoming as it can be, being damp, cold and breezy, but it didn't stop plenty of runners turning up. 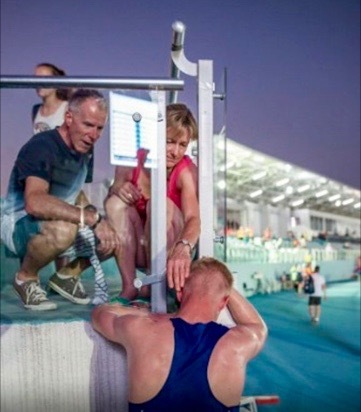 There were seventeen 1500m races, with between 15 and 20 athletes in each, plus three 3000 metre races at the end of the night. Katie Goodge (u15) was the first from TAC in action and ran 4.57.20 for 5th in race 7 of the 1500s, just outside her pb. Graeme Saker (m50) ran a 4.42.27 in race 11 and Dan Schofield (u17) was just outside his best in race 13, with 4.32.80. Fin Harvey (u15, 2nd claim) knocked over 3 seconds from his best with a 4.21.43 posting. Each of the 3000s had TAC representation. Graeme Saker paced George Kelly (sm) around his first ever track race at the distance. Graeme ran 10.26.24 and George 10.26.30. 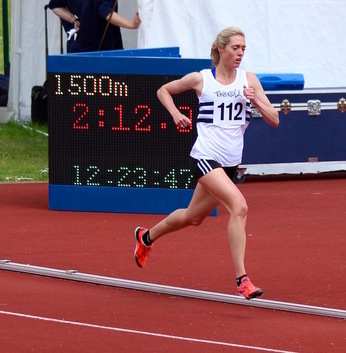 In race 2 Nicole Taylor (sw) ran 9.46.07, reducing her two year old pb by three seconds. In the last race of the night we had three athletes competing, as 27 toed the line. Ally Kinloch (u20) had another tremendous performance to place 2nd in 8.18.21, taking two seconds from the pb set last month. This was significant, as it was the second time he has run inside the European under 18 championship qualifying time, by a large amount. It also puts him top of the current European under 18 rankings. 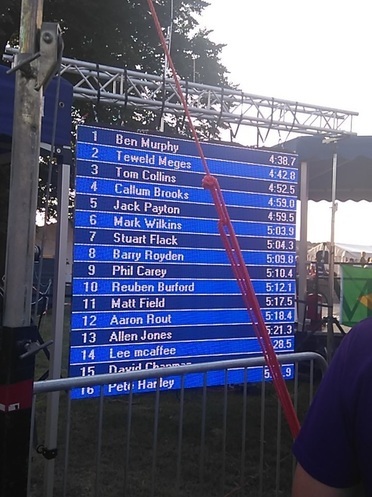 ​James Puxty (u17) also had a fine run with 8.55.32, improving by eight seconds, from his best set the previous Sunday and Michael Ellis (sm) ran a six second pb with 9.15.62. Lily and Sophie Slack continue to dominate with both scoring exactly the same 85.19%, great running. Both also ran PB’s, this being 3 out of 3 for Sophie (15 bonus points), making her position at the top of the leader board very strong. Luciana Anderson is the best of the rest, but others will need PB’s to get close to the leaders. The league table is on the parkrun page. TAC placed 5th of the 6 clubs in this Premier Division Match. Summary results are on the Results 2016 page. There were six personal bests and two seasons bests from the eleven TAC athletes. ​Unfortunately I think that I had my camera on the wrong setting for some of the later races and therefore have no good photos from some races ! Richard Owen kindly supplied a couple of those shown. 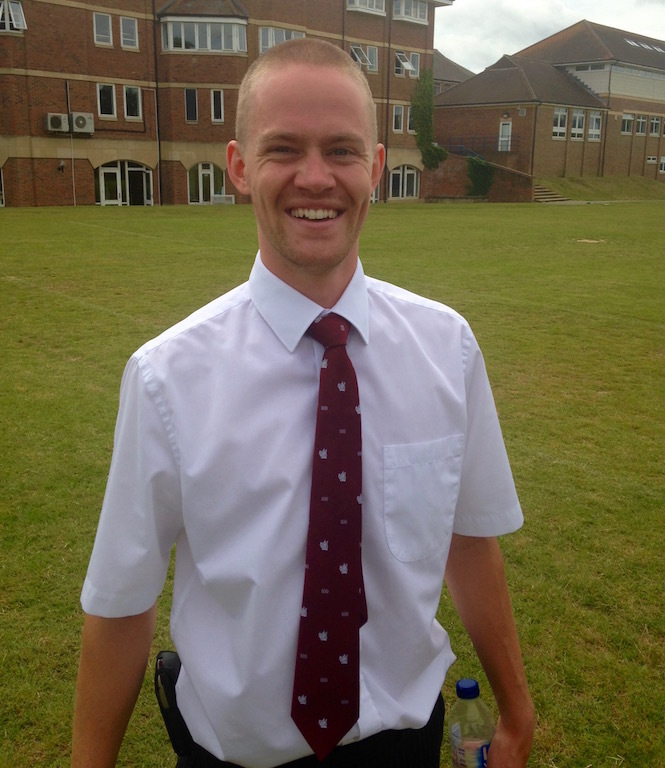 James Pigot, who has recently qualified as a doctor, is working in Australia for a few weeks. He reports that he put on his TAC vest, for the first time for a while, to finish 8th at the Melbourne parkrun in Australia, in around 17 minutes. Ryan Driscoll finished last of sixteen in his heat of the 3000 metres steeplechase, over half a minute outside his best with 9.30.47. Ryan explains that a knee injury hampered him and is now looking forward to being home for the rest of the Summer. 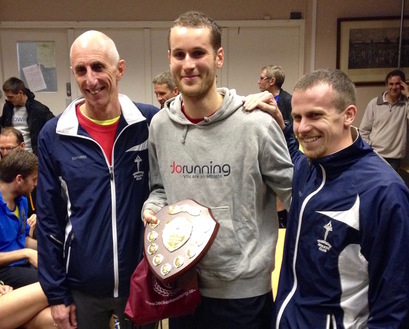 The men's team won again in division 2 of the league, whilst the ladies were third. Full results are on the Results 2016 page. 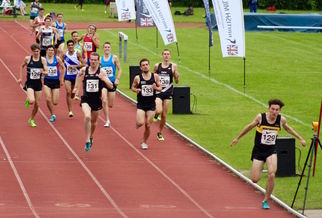 Robbie Farnham-Rose finished 10th of 12 in his 1500m in the East Region Championships. He ran 3.51.96, having been beaten in a last lap burn up. 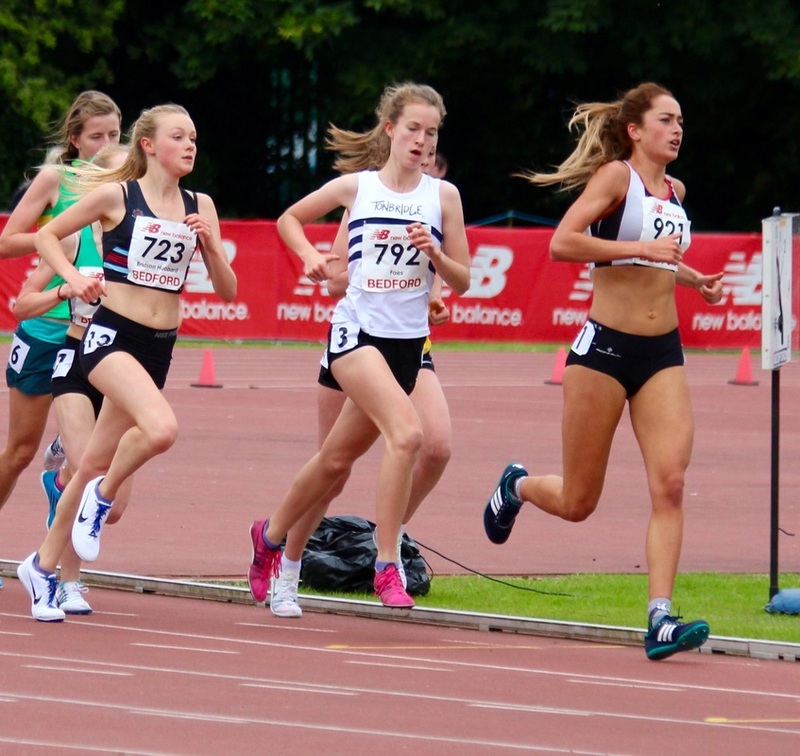 Ashley broke the TAC senior womens 5000m record with her time of 16.30.00This is inside the Olympic Trials/British Championships qualifying time, making Ashley the seventh TAC distance runner to qualify. 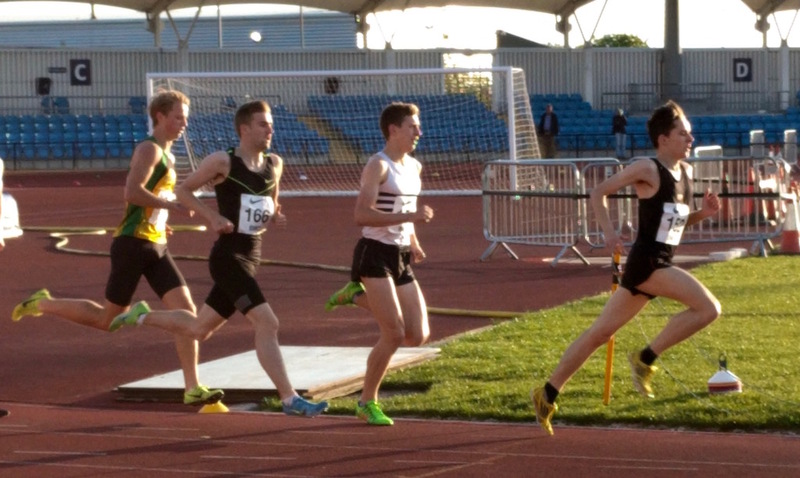 George Duggan ran a 1.52.35 pb 800 metres to finish 4th in the Guest race, running for Loughborough University. 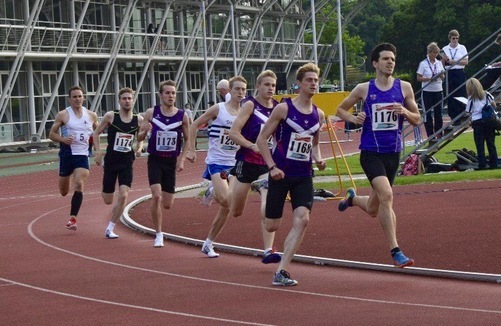 James West ran a 1.50.35 pb 800 metres to finish 5th in the Match race, running for Loughborough University. 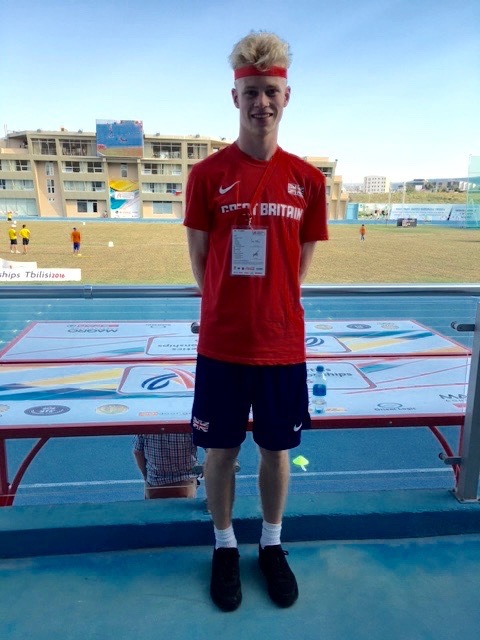 Chris Olley finished 2nd in the 3000 metres in 8.06.24, which was a 13s pb. Henry Pearce ran 8.47.50, although he was not at his best. Kathleen Faes finished 6th in the womens 3000 metres in 9.39.59, for a 20.6s pb. Kathleen, alongside Alasdair Kinloch, is now the second Tonbridge distance runner to gain the European under 18 championship qualifying time, enabling consideration for GB selection. The time was also a TAC under 17 club record. Nicole Taylor ran her first 3000m steeplechase for two years annd finished 3rd in 10.37.59, less than half a second from her pb, but an Olympic Trials qualifying standard. Nicole was representing the British Universities and Colleges Team. 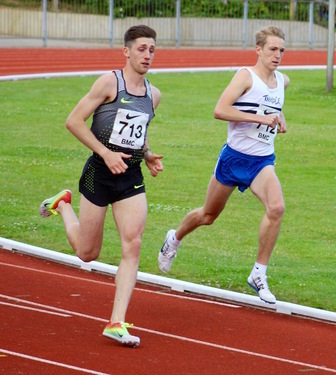 ​Tom Holden, who is in the process of joining TAC ran 8.11.13 in the 3000 metres, for a 19 second pb, running for Loughborough University..
Ben Cole was the only TAC runner in action and made his 10k track debut in race 4, finishing 14th in 30.33.30. This was just outside his road pb. Tonbridge won the match by 2.5 points according to the final results, now on the Results 2016 page. From a distance runners point of view maybe the most notable performances came over 400m ! Becky O'Hara seems to be taking a little from her personal best with each race and ran 57.0 on this occasion. 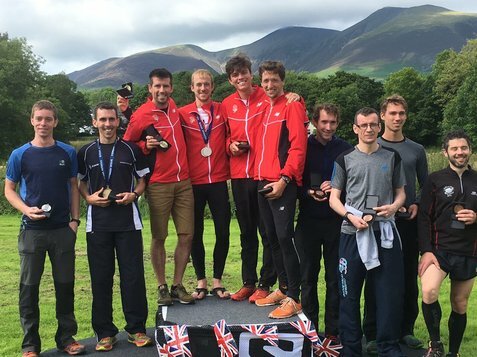 Sean Molloy comfortably won the mens race in 50.2, but it was his 48.4 relay leg that caused a stir and well worth a watch on the video page. Michael Ellis was very close to lapping the whole field in the 3000 metres steeplechase, as only team mate Tim Corby was spared. Provisional results are now on the Results 2016 page. 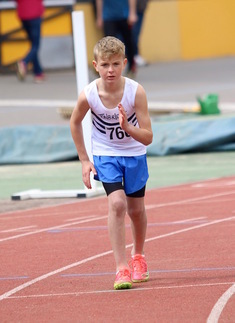 ​​From a distance running perspective there were good wins by both Fin Croll (u13 800m) and James Kingston (u15 1500m and four personal bests, from Fin, Alex Sandberg (800m), Megan Moore (1200m) and Henry Taylor (1500m). 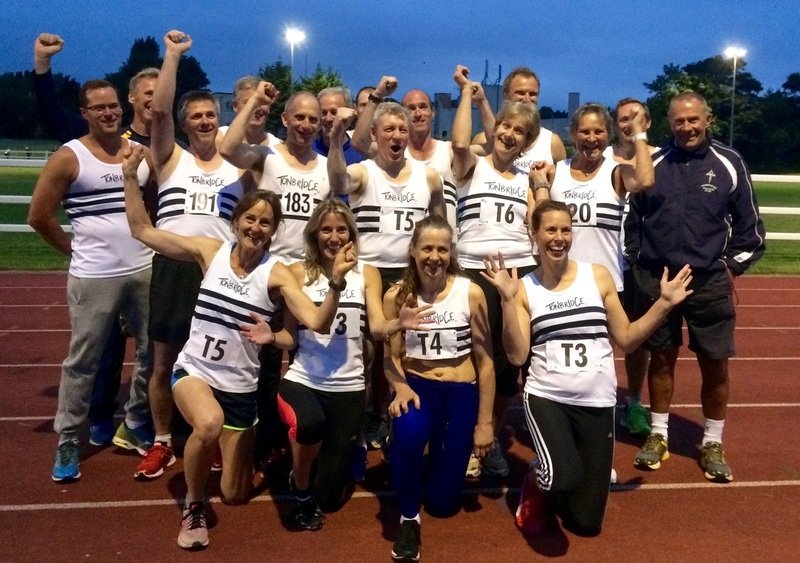 Three TAC distance runners competed at Watford on Wednesday evening, in the first of the Summer series that included British Milers Club Gold Standard races. 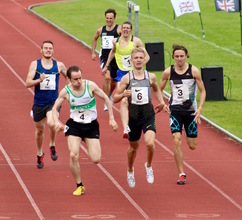 Sean Molloy raced in the first of these and finished 4th in 1.50.87 and although disappointed that it wasn't faster it was his quickest time since July 2014. Hopefully, he can continue to move forward from this. Donald Carter also had a tough one in the B 800m finishing 8th in 1.57.64. Toby Ralph was our only representative in the fifteen open 800m races and went in the final and fastest race of the evening. Toby was 'fresh' from his Kent under 20 victory at the weekend and once again found himself at the front, early on and pushing the pace. He looked strong again and improved his time to 1.53.98, for a personal best. The winning team was Graeme Saker 15.01, Dan Bradley 13.33 and Greg Cole 14.20. Dan was two seconds away from running the fastest lap. ​Full results from both days are on the Results 2016 page. Maria Heslop (2nd claim TAC) was first lady in 37.31. Then in the official results Jordan Saul was 12th in 38.17, whilst George Kelly doesn't appear at all. George reckons he ran 39.45 but lost his electronic chip, whilst Jordan had a similar issue, when in 4th and lost ground due to a chip and shoe lace issue. My theory that our members who live near Sittingbourne always seem to have 'issues' at races, holds fast ! Robbie Farnham-Rose missed a medal by just 1/100th of a second in the SEC Championships 1500 metres final and was just 0.4s away from the winner in 3.51.11. Ryan Driscoll finished 2nd over 1500 metres at the meeting in a new personal best of 3.47.36. Videos of the TAC 1500m races loaded ! TAC had two representatives in the Kent team. Max Nicholls finished 4th overall and perhaps could have been in the top two, as he was directed off course at one stage. 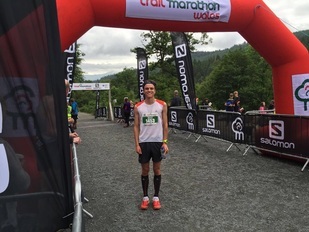 Julian Rendall, who is a less experienced fell runner, placed 26th. Yet another glorious sunny day with a light northerly wind. The Men 55 were the first race we were involved in, as unfortunately on this occasion we were not able to put out a ladies team. Brian improved on his time from last year by 11 seconds. Although down on last year it was great to see Cain running after a tricky few months. Watch Maurice accelerate up the finish straight to hold off a challenge from another athlete, plus other action from the day. In a change to previous years the M35 race (6 Stage) started 5 mins before the M45. Unfortunately our M35 team had become depleted to just 4, however this set up an intriguing race between our M35 and M45, both with 4 runners, as on paper it looked like it would be very close to a 5 minute time difference. 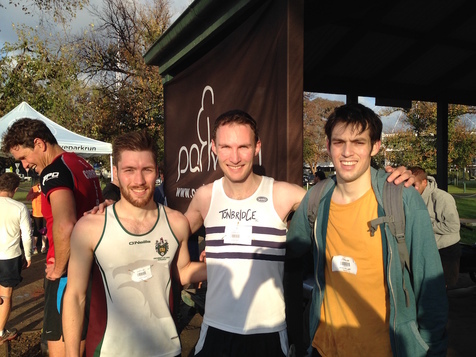 Tony Bennett had the “pleasure” of making his TAC vets debut (he ran for the club as a junior) as first leg runner. Having negotiated an attempt to put on his old TAC vest in which he actually got stuck and had to be helped to release his arm, he was kitted out in Rachael Bennetts vest, certainly still effectively a compression outfit! He held his composure well to run 18.04,despite the furious pace set at the start. This was probably ahead of expectation. Graeme Saker started M45 team off and improved on last year by 23 seconds to 17.02 and 18th ( when comparing to the M55 AG which Graeme will be in Sept he was encouraged to see his time would have been 3rd fastest, so hopes of an International vest are positive for the winter) John Ridge on second leg for M35 got under 19 minutes in his first attempt at the course. While Phil Coleman also lowered his time from last year by 14 secs to 17.50 (20th). At this stage the gap between the teams was 2.45 . Ian Crawley who made his TAC debut at this event last year, knocked a massive 52 Secs off his time and finished under his 20 min target in 19.55. 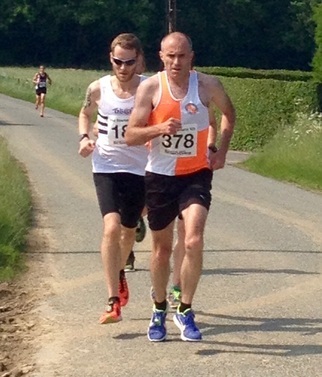 However for the M45 team Mark PK also took 7 secs off last years time in 18.15 (20th place) This left Steve Brooks (20.38) with a lead of 1.05 over Andy Wood (19.04) as they started the last legs. Despite Steve improving his time by 10 secs, it was not enough, as Andy Wood encouraged by the sight of Steve at the turn around point had a target to chase and was able to catch him at the lake and finish 29 secs ahead. It was great to see Andy Wood run well after a tricky 2015/16 winter. As a team the M45 improved from 1.14.15 last year to 1.12.11, but surprisingly this 2 minute improvement only equated to one place! 27th to 26th this year. Last year this would have got 18th place…. 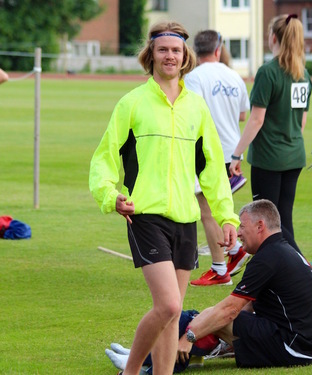 Ben Reynolds (2nd Claim TAC) ran the second fastest M45 leg of the day in an amazing 15.28, as his team Thames Hare and Hounds won the M45 race. We were all very grateful for the fantastic support team of Alan Bennett, Di Bradley and Nicky Buckwell. It really helped at the point in the race where the body flags! Thanks to everyone for making the effort to travel to Sutton Coldfield, which we all agreed was well worth it. 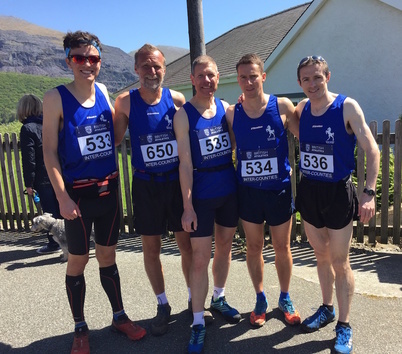 ​Looking at the potential M35 team (Parkrun results yesterday of 3 qualified TAC runners 17.24, 17.29 and 18.57, plus Julian Rendall running for Kent in a mountain race) if we can have a concerted effort the team could be well up there challenging for a top 10 place. Robbie Farnham-Rose (Alabama) had an excellent race to qualify for Saturday's final with 3.46.64 in second place in his heat. ​Luca Russo (Missouri) suffered in his heat and almost fell at one stage, being 10th in 3.58.71. A large turn out as the Summer Park Run GP was finally run in Summer weather, which appears to have suited a number of athletes who ran PB’s to collect bonus 5 points for their scores. 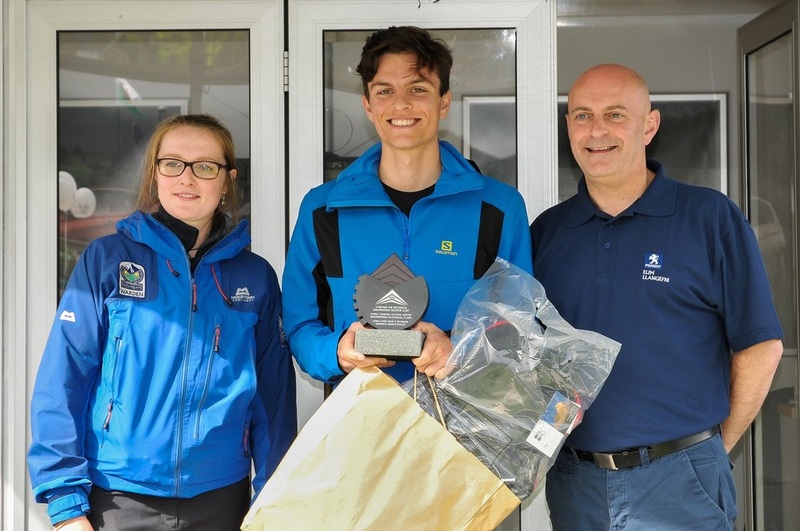 The top 3 age graded runners were Sophie Slack, Lily Slack and Sam Crick who all scored over 80% and rans PB’s with Sam being first home ahead of previous GP winner Dan Bradley. Sophie appears to be intent on keeping the Trophy on her mantelpiece ! 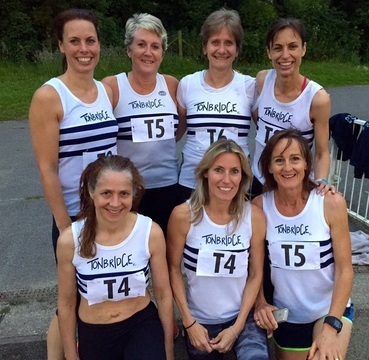 Tonbridge AC won both the mens and womens division 2 matches and now top the mens and are second in the ladies overall, after the first two matches. Team Manager Mark Pitcairn-Knowles is doing a cracking job, in not only launching TAC's teams in this league for the first time, but getting so many to compete. I just hope a few are ok on Tuesday morning, as having seen the results, a some were competing in more unusual events for them ! On a very warm day there seems to have been some good middle distance running from a number of TAC youngsters. The biggest pb came from Olukorede Fasina, with a division 2, under 13 boys, 1500m win in 4.57.1. 3000m steeplechase - Alex Howard (Oxford) 1st in 9.13.6 (pb). 1500m - Miles Weatherseed (Oxford) was 4th in the mile with 4.19. Michael Ellis ran 10.16 for 3000m steeplechase, racing for Sheffield AC, for whom he has high claim competition status with. Michael is at university there. There were 473 finishers at Tonbridge ! This weekend is a relatively quiet one, with just the Kent Young Athletes competing at bromley on Sunday. Just as a reminder to others, you are more than welcome to come along on Sunday morning for training at 9.30am, where there is either a run or a faster track session available. 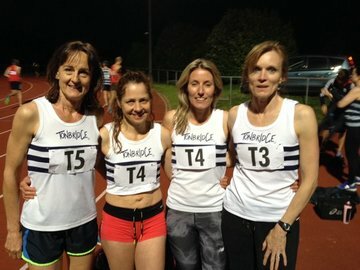 TAC had just three competitors at the Watford meeting and enjoyed the best conditions of the season so far. 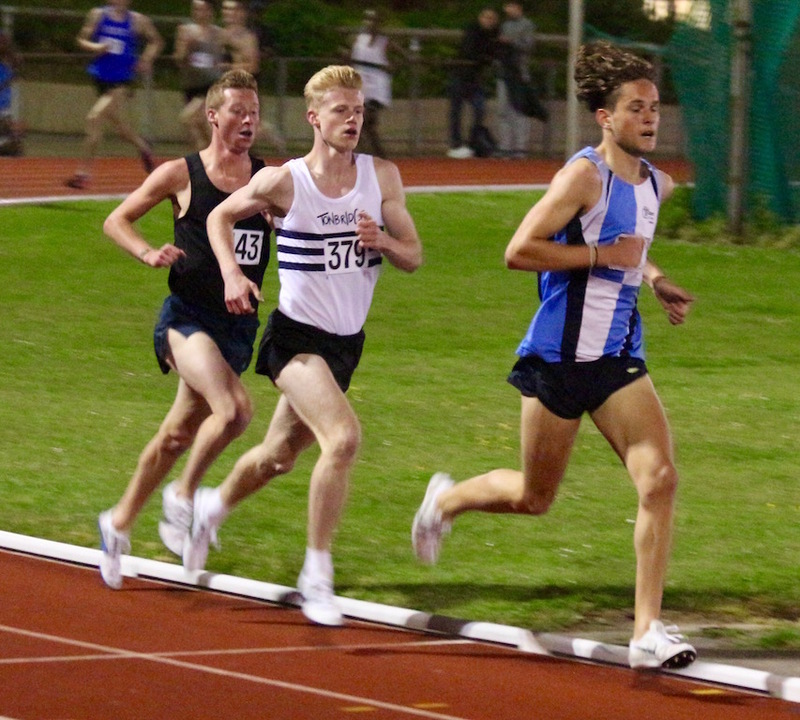 Graeme Saker ran 9.47.83 as an over 50, in the first of two 3000m races, before we witnessed a cracking final race of the evening. Donald Carter and Ally Kinloch joined the train of the lead group runners at the front of the 3000 metres and both came away with personal bests, as they finished 3rd and 7th, respectively. 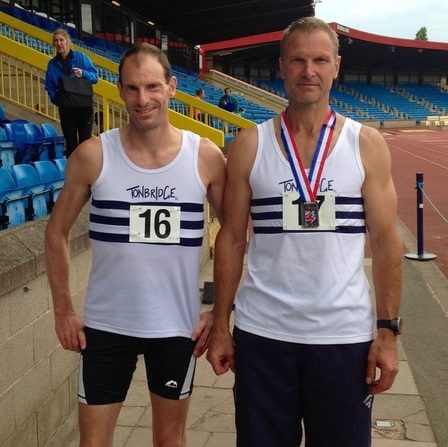 Donald took ten seconds from his pb with 8.14.29 to go third on the 2016 TAC rankings, whilst Ally had a superb race to run 8.20.98 and take more than twenty seconds from his own best, with 8.20.98. Ally's time could be significant as there is a European under 18 championships this year and he was well inside the qualifying mark of 8.32. However, the selectors look for more than that as one of the criteria is to be able to show 'top 8 potential'. He had another under 18 just ahead of him last night, but last year his time would have ranked him fourth in Europe, for the age group.